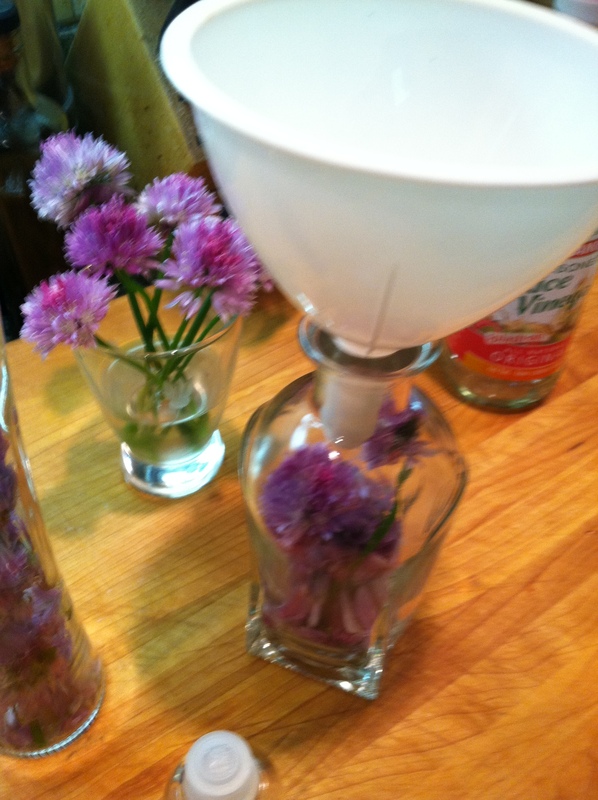 Chive blossom vinegar isn’t a normal thing to be making in January, but my wish for chive blossoms was realized. This winter had been on the warm side for us. It was just last night the geranium and the jalapeno plants bit the dust to freezing. 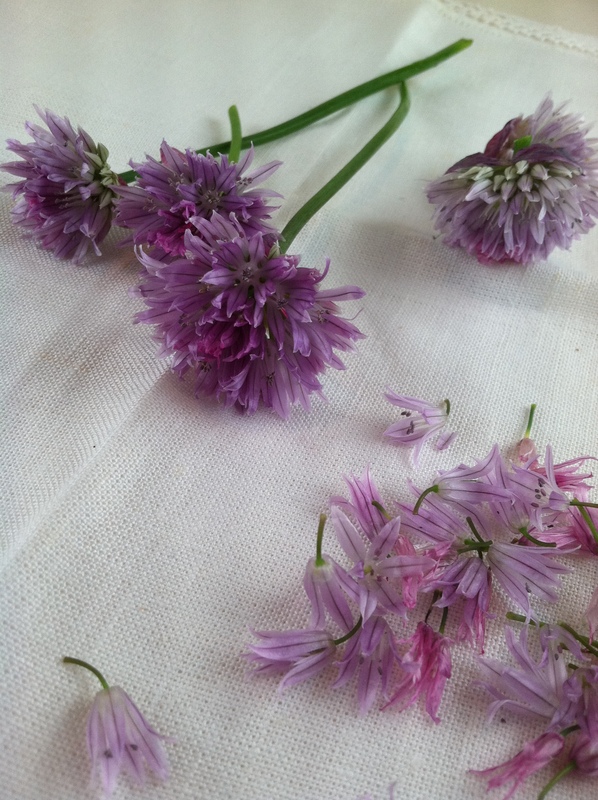 While making a salad for dinner the other evening, my thoughts turned to chive flowers and all the yummy things I could do with them. 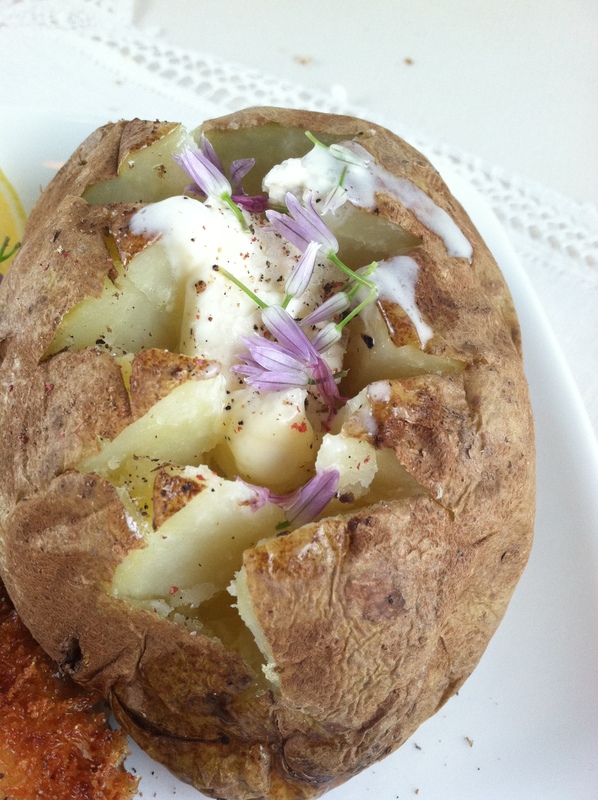 I thought how nice it would be to have some chive blossoms to add to the salad, or sprinkle some over the baked potatoes. 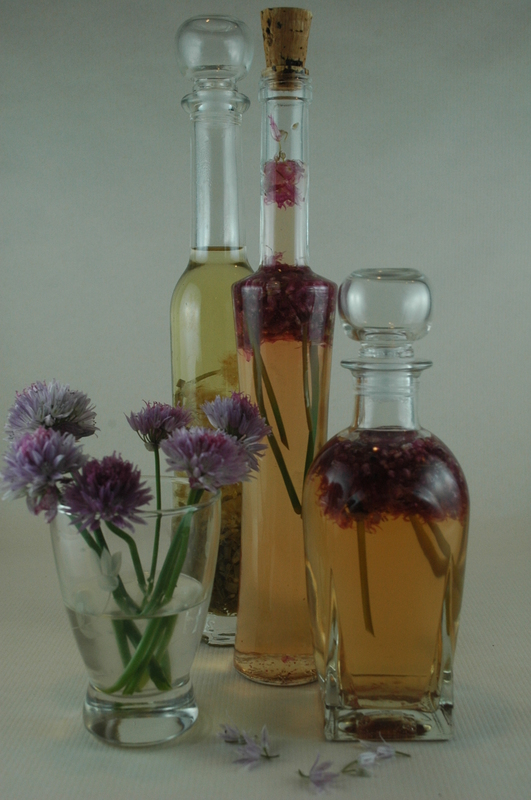 I was thinking about making more chive blossom vinegar but alas, being January, my desire would have to wait until spring. 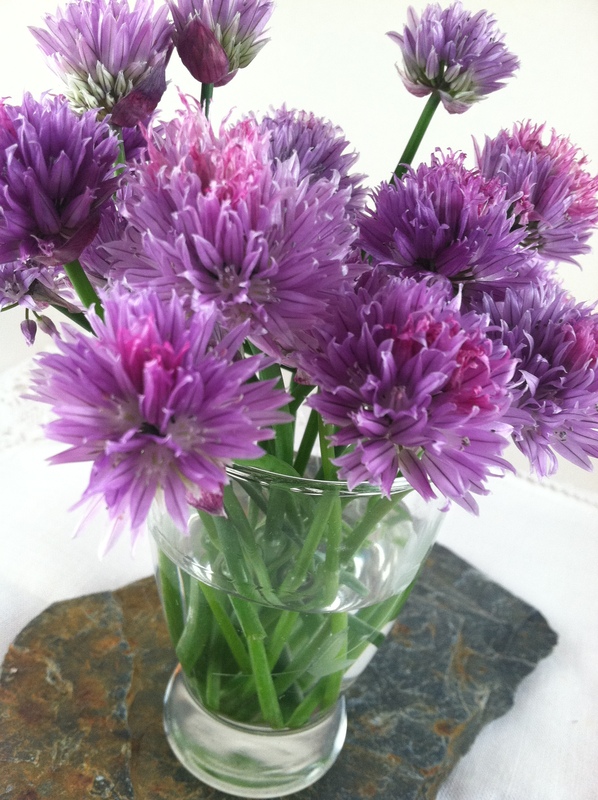 Chive blossoms have a delightful onion or garlic flavor, depending upon which type of chive you have. Onion chives have lovely purple flowers that I really like; garlic chives produce white flowers. But look at what I found! As I rounded the corner towards my office, right there in front of me was a lovely plot of blooming chives in the schools herb garden. I picked as many as I thought I needed and ran home to toss them into the evening salad and make some Chive Blossom Vinegar for salad dressings in about a month. Chives are quite simple to grow and actually are perennial so they come back year after year. I have both garlic chives and onion chives growing in my garden. They definitely are not flowering now. In fact they look quite pathetic until a bit of warmth cradles them a bit. The goal is to make it look pretty and attractive. Place prepared blossoms into an attractive bottle. Boil enough white wine vinegar or rice wine vinegar to fill the bottle. Use a funnel to fill the bottle with the hot vinegar. Cork or seal the bottle. Label with the date you made the vinegar. Let steep for 30 days. After the flavor has developed, open the bottle and experience the fresh aroma of the chive blossom vinegar. Use it to make a simple vinaigrette. Place all the ingredients but the oil into a bowl and whisk to combine. Whisk in the oil and serve. This is a temporary emulsion which means you will need to whisk it before using as it will separate. Toss the sliced vegetables in a bowl and then arrange attractively on salad plates. Drizzle Chive blossom vinaigrette over salad and serve. To make this go over the top, drizzle a few drops of truffle oil over the salad too. 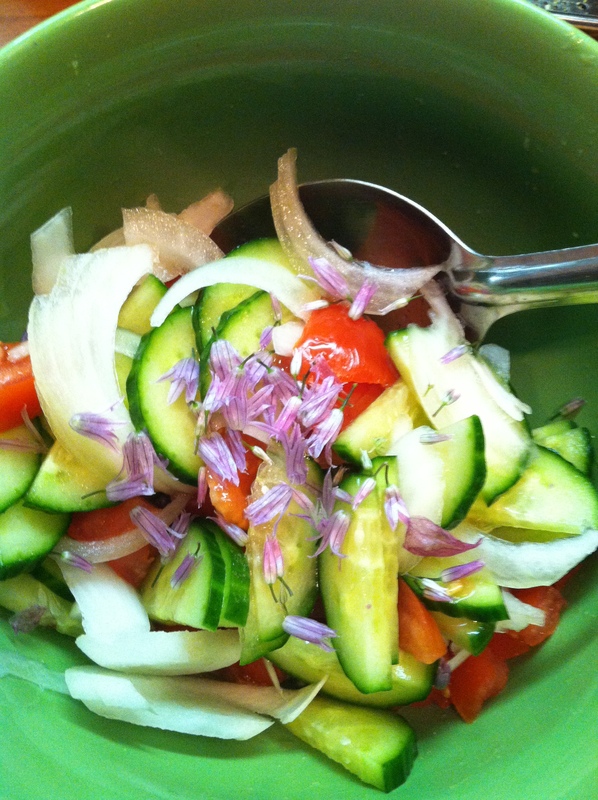 This entry was posted in Recipes, What every good cook should know and tagged Blossom, Chives, Cucumber, garlic chive, Mustard (condiment), Olive oil, Onion, Salad, Vinegar. Bookmark the permalink. Love this recipe. Perfect summer salad!